​Just as there are rules for working with exponents, there are also rules you can use when working with logarithms. These rules can be used to simplify or expand logarithms. In this lesson, we'll look at 3 rules: the Sum Rule, the Difference Rule, and the Power Rule. Keep in mind that these rules only apply for logarithms with the same base. Make sure to notice that the base stays the same. This rule only applies to logarithms with the same base. 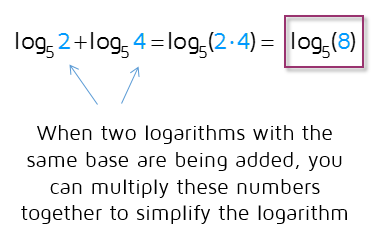 This rule also allows you to expand (split up) a logarithm into two separate logs. ​Make sure to notice that the base stays the same. This rule only applies to logarithms with the same base. To expand the log, bring the exponent out to the front. Want to see a few more examples? Check out the short video below. Ready to try some problems on your own? Click the START button to try a practice quiz. Want to learn how to solve an equation with logarithms? Check out one of the solving logarithmic equations lessons.